Bango.com is a service that handles payments for off-portal mobile content providers. If you are selling ring tones, games, videos or whatever on the mobile web Bango handles the complex details of collecting funds from users anywhere in the world either by direct billing on the customer’s phone bill, a credit card or PayPal. I’ve heard only good things about Bango’s billing service. I was intrigued when I learned about Bango’s new Bango Button service which is supposed to make it easy to promote your mobile content – like a mobile website, image or a ring tone. Carlo Longino at MobHappy mentioned the Bango Button in a recent post and provided one that links to MobHappy’s mobile site. Carlo did warn that the user experience was pretty bad but I wanted to see for myself and set up this Bango Button, which points to WapReview.mobi. From the publishers point of view setup is easy, but what about the end user experience? It turns out that the button behaves differently depending on whether it’s clicked from a desktop browser or a mobile browser. Desktop browser: a pop-up appears telling me to enter get76778.wap.com on my mobile phone. That’s a memorable address, not! 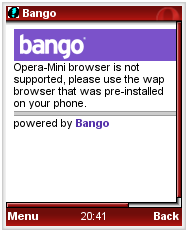 Opera Mini: Bango tells me that Opera Mini is not supported and suggests I use my phone’s built in browser. Major faux pas here, whatever you do on the web, mobile or not, you should never tell the user that their browser isn’t good enough. Every chance I get, I tell my readers to use Opera Mini because it’s the best mobile browser in the world and Bango turns around and says it’s “not supported”. Opera is one the most web standards compliant browsers on the web, there is no excuse for not supporting it. WebKit: The built in browser on my Nokia N95: All I get is a blank page. Even http://wap.com gives a blank page. MobHappy.com loads fine in WebKit as does Bango.com. Openwave 7 Browser on my Motorola i855: It sort of works, I’m taken to the Wap.com mobile portal, where a user ID has been created for me and there’s a link to MobHappy. Except that the first time I try it, the Wap.com page times out and when I retry I get an “infinite redirect” error. I try again and this time the page loads. But when I click the MobHappy link, I get an error saying that either my proxy server is misconfigured or my computer is possibly infected with spy-ware. I kid you not it actually said that! This is using the built in browser on the phone going through my carrier’s gateway. There is no computer, no proxy server and no spy-ware involved. I try again later and it actually works this time! I’m sure that Bango will fix the button so that it works with all browsers. But I really don’t understand what advantages the Bango Button has for publishers. It just as easy to add your own link or button that goes directly your mobile site. This entry was posted in Browsers, Usability by Dennis Bournique. Bookmark the permalink. Regarding Opera Mini, Dennis – you are right that Bango should be able to be a bit cleverer with making WAP.com work on Opera mini. However, teh reason we decided to put up teh “warning window” was that we were encountering problems caused by Opena Mini when used to visit content provider sites. For example, if you go to my bookmarks on your phone (at wap.com/ray on your normal phone browser, you can visit 30 or so of the sites I have buttoned or bookmarked. The vast majority of those sites will do a device detect and therefore they don’t work well on Opera Mini (as they might then give the PC experience). People providing “transcoding” capability “in network” like Novarra for Vodafone UK and Openwave for Vodafone ES have run into the same problems, which damage the mobile user experience. They are working on solutions that detect whether the destination site responds to the devive hearders and don’t transcode. Alternatively they offer whitelisting capability as a temporary fix. I assume Opera must be working on similar solutions. Thanks for the comments Andy. I’m looking forward to trying the Bango Button again when the issues I had using Webkit and the Openwave browser are resolved. Regarding Opera Mini, I know it presents challenges in the areas of handset detection and verifying content downloads. However, Mini is extremely popular and is starting to be included in firmware by carriers and handset makers. It’s a very addictive browser, so much more capable than the typical embedded browser that users who try it rarely go back to using the built-in browser. Completely blocking Opera Mini from wap.com seems like overkill. As far as I can tell, wap.com is a site that lets users maintain a list of bookmarks to mobile content which can be either free or paid content. If the issue is that Bango can’t reliably bill and collect from Opera Mini users then only block Opera Mini users when they try to bookmark or access paid content. I don’t see any reason why Opera users should not be able bookmark free content on Wap.com. By completely blocking Opera Mini, Bango is creating an unfavorable impression in the minds of Opera Mini users and anyone who believes in an open web accessible by any browser. 1) someone needs to pay for the text message / WAP push – in countries like the UK where free text messages are possible this works great. If you have a button you can easily top up your text credits and turn this capability on. 2) Many operators require that the content is certified for general use before a text message can be sent that links to it. This takes time and money to achieve – Bango does this for many of it’s customers but this means that for those countries (including the USA) it is not possible to legally use an SMS trigger on general content shared via community sites and blogs. With this in mind, the short URL proved to be the most successful for general consumers. Naturally we are looking at ways to improve things further and are exploring ways to use Web Trigger in more cases. Firstly, the use of Opera Mini – I agree it’s a top browser, however it is not perfect in the mobile world for a couple of simple reasons. For some time now mobile browsers have been getting smarter, using technology only available on mobile. This has allowed for a degree of location awareness and most importantly in our case the ability to identify the handset and user. Opera Mini is ultimately a PC browser working on a mobile phone, so it fails to benefit from these advances. We are speaking to Opera about this issue. The Bango Button uses this automatic user identifier (Bango Fingerprint) to log the user in and bind the handset to the PC (where we store a cookie). This simple step makes all the difference with ease of use and allows the Bango Button to function. In your report you only saw the initial, first time experience (which failed). The get76778.wap.com URL is a form of TinyURL but for mobile (a get code) – you only get this type of URL the first time. And if you don’t want to type that, we also auto-generate a QR Code to make it easier still. Once you have entered this get code once we have logged you in and automatically linked your PC and phone. From this point on you can click on as many Bango Buttons on the PC as you like – your phone could be in another room or switched off at this point. Each button you click on is added to a personalised list held at wap.com. This much shorter URL is now the only URL you need to remember. From wap.com you can visit the stored links, manage them and share them with friends. The whole purpose of the Bango Button is to allow people to access cool mobile stuff from their PC browser – it’s a link that crosses device (from PC to mobile). Take a look at http://www.myspace.com/moonlife on your PC for a good example. From this band site fans can get ringtones and wallpapers – either free or at a cost. I would be interested to see how a link or any other mechansm can achieve the same results as quickly for free. In the meantime, We are always keen to hear thoughts, feedback and ideas on this and other Bango technology and products from all your readers. Our aim is to make accessing the web on mobile simple and powerful – we can only do that with feedback. VP Product Marketing at Bango.